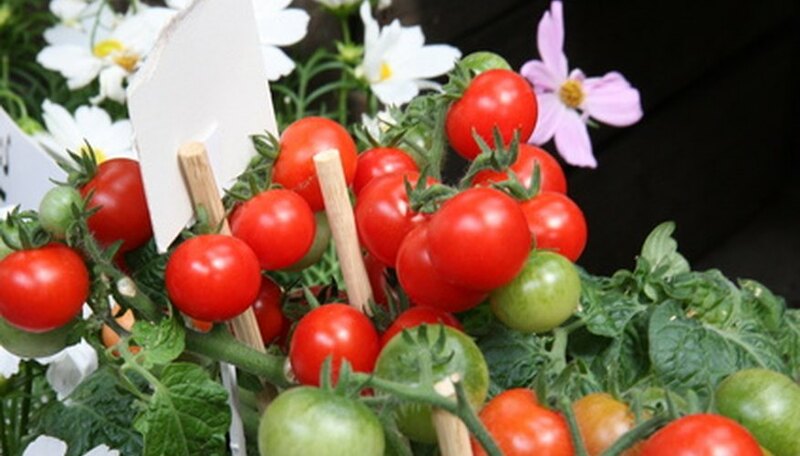 Growing tomato plants in containers is a way to grow fresh tasting tomatoes in a small amount of space. However, tomatoes have a large root system and require a large enough container so the soil in the container does not dry out rapidly during the heat of the growing season. A tomato plant container should be at least 2 inches wider in diameter than the root system of the mature plant, or the roots become too crowded and the health of the plant is affected. When this occurs, tomato plants need to be transplanted into a larger container. Find 5-gallon buckets or similar sized containers with five drainage holes in the bottom--each drainage hole approximately one-half inch wide. Tomato plants cannot survive if left sitting in waterlogged soil, so the containers must be well-drained. Add pea gravel or similar sized rocks to the bottom of the containers to a depth of 1 inch. Gravel is added to provide stability in the buckets, because the tomato plants become top-heavy as they grow. Also, it prevents the drainage holes from becoming plugged by potting soil and the tomato plants' roots. Add enough potting soil into the new containers so the tomato plants are planted 25 percent deeper in the new containers than planted in the previous container. The tomato plants will develop new roots along the stem portions that are covered with soil, creating sturdier plants. Remove the tomato plants from the old containers by placing one hand at the base of the plants over the root system and turning the pots over so the plants and their root systems are easily released from the container. You may need to tap on the outside of the old containers to help release the soil and roots from the sides of the containers before attempting the removal process. Do not pull the plants out of the containers by their stems or the plants can be damaged. It is best to transplant one plant at a time to minimize the root systems' exposure to the air while they wait to be transplanted. Pick each plant up by the root ball and place the plants into the new containers while disturbing the roots as little as possible. Remember to plant at the required depth of 25 percent lower than its previous location. Pull any leaves off the plants that are buried by the new potting soil. Add new potting soil around the roots while providing water to the soil to create a seal around the roots and prevent the formation of air pockets. Fill the containers to within 1 inch of the top with potting soil after planting each tomato plants. Cover the root base of each plant with a one-inch layer of mulch to conserve moisture. Thoroughly soak the root base of the tomato plants with water to prevent transplant shock and allow the tomato plants to settle into the containers.